It’s that time of year again: aisles of gift-wrap and Christmas decorations have taken over every store, and the holiday spirit has arrived in full steam. December is a time of tradition, joy and cheer; a time to give, receive and help those in need. You can definitely feel the spirit of Christmas magic floating in the air everywhere you go. With Christmas coming up, and the New Year quickly approaching, there are many reasons to smile this Holiday Season. There’s no greater gift during the holidays than the gift of spending time with your loved ones. Spending quality time and appreciating the ones that matter the most is the true meaning of the holiday season. The spirit of the season always comes through as people take time to gather with family and friends, or attend work parties with co-workers. Whatever your holiday traditions are, whether they include large family dinners, ugly Christmas sweater parties with friends, or cuddling by the fireplace with your significant other, being around the ones you love is sure to put a smile on your face. Everywhere you go, holiday displays light up the darkness with the most bright and colourful decorations imaginable. Christmas trees filled with ornaments collected throughout the years have light up households. Halls are decked with boughs of holly, and mistletoe is hung. Children are lined up to sit on Santa’s lap to take a picture, and give St. Nick their Christmas list. You won’t be able to help but smile as the feeling of magic and warmth surrounds you. Who doesn’t love presents? But nothing compares to the feeling of seeing the look on a loved one’s face as they open their gift! This holiday, don’t stress about buying the perfect gift for your friends and family. Instead, focus on do-it-yourself presents that show your loved ones you are thinking of them. Remember, it’s the thought that counts! The feeling of sharing and caring is representative of this special time of the year, so take a moment to give back to others. Give a smile to someone in need by giving back to charities and local food banks this holiday season. Holiday treats such as eggnog, gingerbread cookies and peppermint stick candy are everywhere this season. Gathering in the kitchen with the family to bake and decorate special cookies, or build a gingerbread house are activities that are enjoyed at any age! Remember, foods that are high in sugar speed up the tooth decay process if proper cleaning is not in order. We know that this is a time of indulgence, and while we want you to enjoy yourself, remember to appreciate everything in moderation. Here’s a tip: brush your teeth after every treat, and give out leftover baked goods to your friends or co-workers. You will have a fun time baking and decorating delicious treats, putting a smile on someone else’s face AND stay healthy! The holidays may take a toll on your teeth if you aren’t careful, so make sure you schedule an appointment with your dentist as soon as possible after the holiday parties start to calm down. The temperature may have cooled down substantially, but this doesn’t mean that you can’t enjoy the outdoors! Grab your children and hit the hills for some tobogganing, or the local rink for some skating fun. If that is not your cup of tea, try horseshoeing or building a snowman. If you prefer a more fast-paced activity, hit the slopes for some skiing or snowboarding. Whatever your preference is, there are many winter activities to help you keep active this holiday season. As 2015 comes to an end, it is a great time to step back from our busy day-to-day lives and reflect on the past year. It is a time to evaluate last year’s resolutions and create new ones. With a new year, comes the possibility of reinventing yourself. If living a healthy lifestyle is one of your New Year’s Resolutions for 2016, don’t forget about oral health. 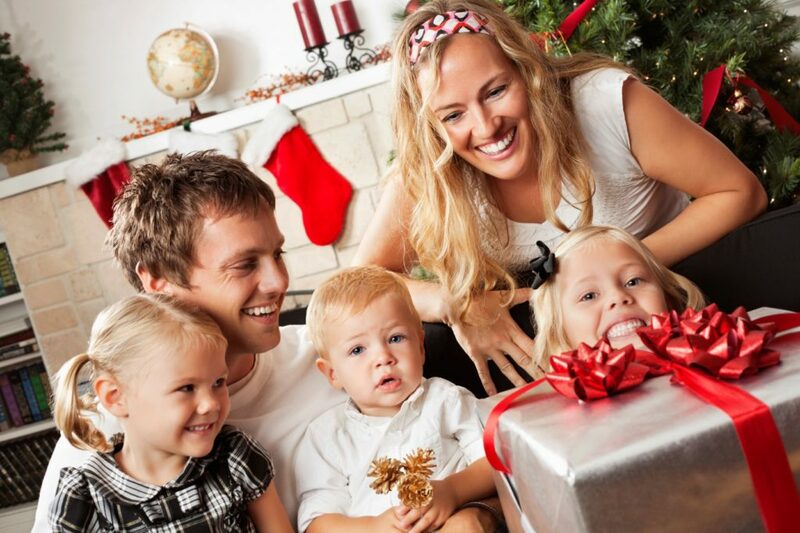 Make oral healthcare a priority for the whole family this year and keep healthy smiles for life! These are just a few reasons to smile this holiday season. We hope that you can find many more reasons to smile and spread the holiday cheer. From everyone at Dr. Walter Heidary Family Dentistry, we wish you a happy and safe holiday season full of healthy smiles!